What Can You Sub for Baking Powder When Making Biscuits? Baking powder seems mysterious when you don't understand the science. You add a tiny amount to biscuit batter and what would have emerged as a flat, dense hockey puck comes out of the oven a fluffy treat. If you don't have any baking powder around the house, don't fret. There are a few quick, easy and convenient ways to replace it once you understand what it is and how it works. The key ingredient in baking powder is another common kitchen staple, baking soda. Chemically known as sodium bicarbonate, baking soda leavens baked goods because it creates carbon dioxide gas when exposed to acids or heat. The tiny bubbles of carbon dioxide create lightness in the dough, which makes goodies like biscuits rise and gives them a fluffy crumb. Another by-product of the same reaction creates sodium carbonate, which tastes unpleasantly alkaline. This is why most recipes call for an acid -- such as a small amount of lemon juice, buttermilk or white vinegar -- to neutralize the taste of sodium carbonate in the finished product. Baking powder tackles the problem of sodium carbonate by introducing enough acid to neutralize it without adding more acidic ingredients. Because these ingredients react immediately upon the introduction of any moisture, manufacturers add absorbent cornstarch to prevent a reaction from taking place until liquids are added to the batter. This reaction is why most baking powder is labeled "double-acting." It reacts first when the powder's acid and sodium bicarbonate come together with liquids in the batter stage, then again when heated in the oven. Now that you understand the chemistry of baking soda you can see how it works and how to make biscuits without it. If there are other acids in the recipe list, such as lemon or vinegar, you won't need to add an acid. Buttermilk biscuits, as buttermilk is an acid, fall cleanly into this category. In that case, add a smaller amount of regular, unadulterated baking soda. As baking soda is much more concentrated than powder, add one-fourth the amount. If your recipe does not include an acid in the ingredient list you'll need to include one. 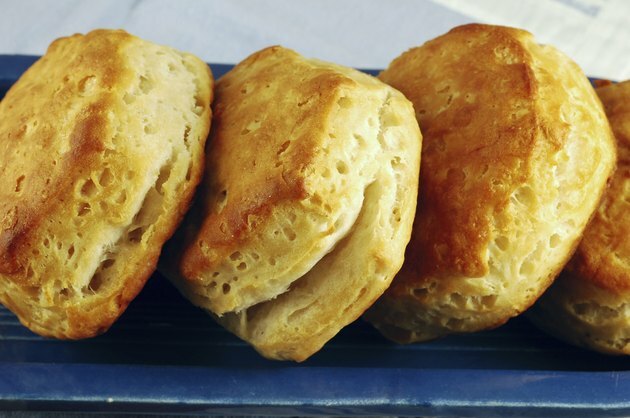 The simplest of these -- and the one least likely to adjust the flavor of your biscuits -- is a proportional blend of baking soda and cream of tartar. Some substitutions involve the use of liquid ingredients such as molasses and soured milk. To avoid affecting the balance of ingredients in the rest of your recipe make sure to reduce other liquids in the recipe proportionally. The Kitchn: Pantry Basics: What's the Difference Between Baking Soda and Baking Powder? Can You Use Baking Soda Instead of Baking Powder for Brownies?